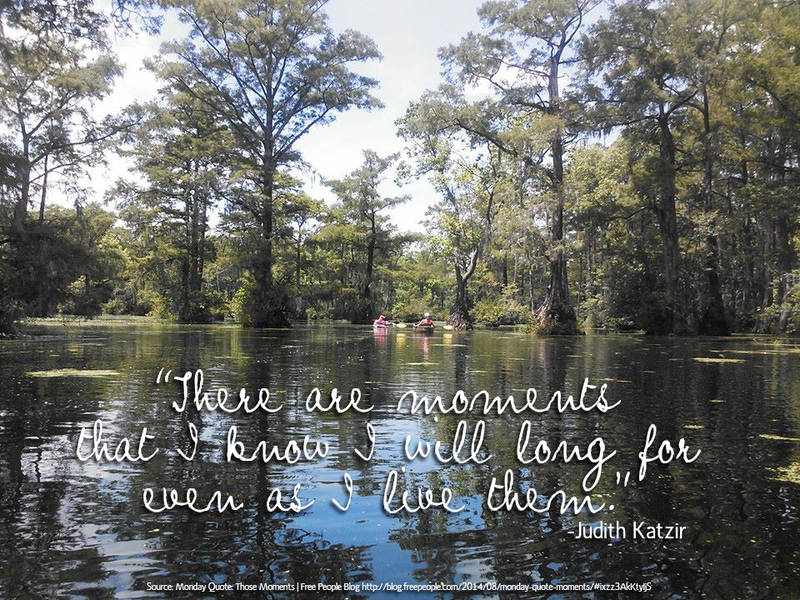 Merchants Millpond is a beautiful NC State Park, home to a 760 acre pond full of cypress trees and wildlife. We saw a small snake, lots of sunning turtles, blue dragonflies, frogs, fish, birds and an alligator. I guess that learning to kayak in a water hole that has alligators in it is not the best idea. The webite says they have 6 alligators in residence, the largest one about 9 feet long. I think the one we saw was about 6 feet long, a rough estimate, since we didn’t get too close. She slapped a tree with her tail to let us know that we were indeed close enough, and we responded by turning in the opposite direction. We got along just fine. We named her “Ali.” The Park Ranger said we were lucky to see one this time of year. I agree. Kayaking has been on my list for a while now. This year I decided it was about time I started tackling that list a little harder as I work on that “what do I want to be when I grow up?” thing. 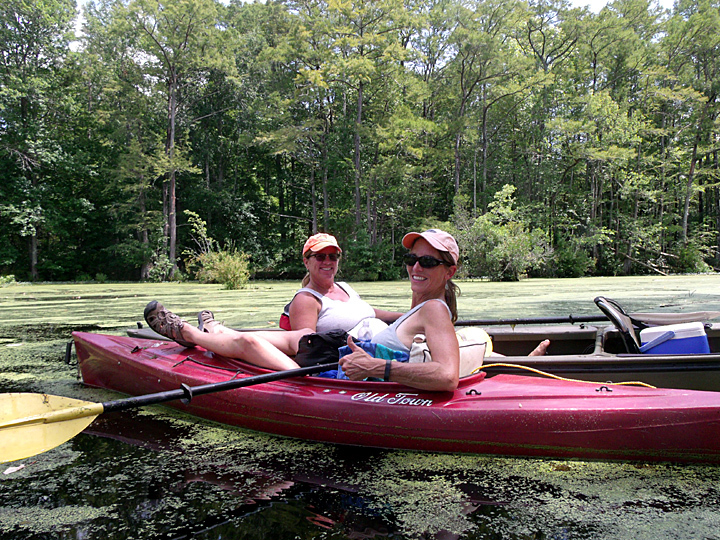 My friends Linda and Paula volunteered to teach me the ins and outs of kayaking. The ins and out are the hard parts, by the way. Paddling was a piece of cake, and kayaks are built not to be tippy, so staying afloat was no biggie either. I am pretty agile in the water, pretty klutzy on land, so getting in and out was a little awkward, but the rest was gliding thru the water and feeling like I belonged there with the fishies. With a little practice, the ins and outs should be easier too. This is something I can see me doing a lot of… Good exercise, plenty of sunshine, gorgeous and serene surroundings, picnic lunch on the water, fab friends… an all around great experience. I can’t wait to go back! SIDE NOTE: My friend Leanne has the most amazing bucket list I’ve ever seen or heard of, and she makes great strides at living it. When you get a chance, check out her blog, Girl vs. the Bucket List. Her adventures range from flying on the trapeze to diving in the arctic to going to Comic-Con in costume. It’s a good read. 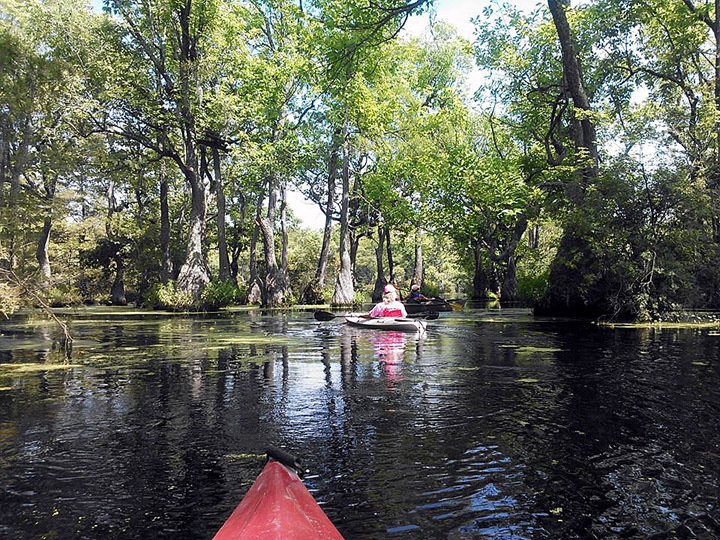 This entry was posted in Uncategorized and tagged bucket list, kayak, Merchants Millpond, state park by Sandy Lupton. Bookmark the permalink.